Flocking of Christmas trees dates back longer than you might think, to the 1800s when things like flour and cotton were used to flock a tree. Although I have not tried it myself, if you are an avid DIYer, you may want to try flocking your own tree, check out this must-know guide to tree flocking HERE. If you would rather skip the mess and buy a tree already flocked, I suggest you check out Frontgate HERE. My flocked Frontgate tree is 10 feet tall, fairly wide, very full, and fully flocked. You can also check out my Insta stories HERE for my video tutorial of decorating a flocked tree. Here are some of the items I used on my tree. Eight rolls of fur ribbon and white snowball ornaments, all from Hobby Lobby HERE. I decided not to use the short stems pictured above, they were too small. After fluffing the tree, the next step was to put the fur ribbon onto the tree. There are a couple ways to do this, you can place it on the back of the branches or have it hang on the front of the branches. I did it both ways and like it better on the front branches. Next I put my ornaments onto the tree. These mercury ornaments are from Balsam Hill HERE and are a variety or large, small, etched, foiled, ombre, and mercury. They are simply beautiful and very HEAVY! After putting my ornaments on the tree, I inserted my stems into the tree. I used pinecone branches that have a dusting of snow, and angled them downward. I found these long stems at Michaels. I used a variety of stems on my tree including these furry flowers. And white frosted Magnolia stems. I also used white frosted poinsettia stems. The combination and different textures of the stems give the tree a balanced look. I grouped my magnolia stems throughout the tree. I used maybe 10 poinsettia stems in total. In a couple areas of the tree, I also grouped together bunches of anemone flowers. I placed loose pinecones on a few of the branches as well, many of which were gathered from our yard. Ornaments with different textures and sparkle add to the wintery look of the tree. The pink ombre ornaments are so pretty. The tree has well over one thousand white lights. I added in a few other white and silver ornaments I have collected over the years. Different pinecone sizes add to the dimension of the tree. These are mini pinecones. For the topper, I used magnolia leaves with gold center bulbs and grouped them with gold leaves and tied them all together with a gold ribbon. I staggered the white poinsettia stems is a zig zag or “S” pattern from top to bottom. Near the bottom of the tree, I have one oversized glass ornament taking center stage. The tree is in our kitchen and we are enjoying it immensely. I hope you all are having a fantastic holiday season, much more to come. 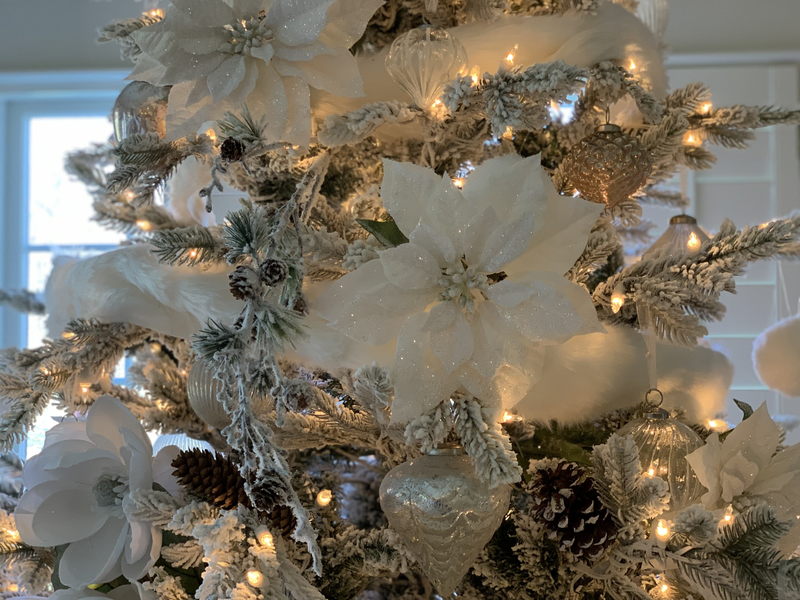 If you use my tips and ideas to flock or decorate a tree, tag me on Instagram HERE, I would love to see it! Thank you – it was so fun to decorate. We are enjoying it everyday. Thanks for visiting. Denise, the fur balls & ribbon just make a statement. You must shop all the time. I hope to run into you sometime. Love, love, love the tree. I might attempt a flocked tree next year. Saw some at Home Goods. Have a wonderful holiday. LOL Donna…that’s what my husband would say! 🙂 Yes, try to get one in the after Christmas sales this year…you will love it! Thanks for commenting! Thank you so much, appreciate you dropping in and commenting!